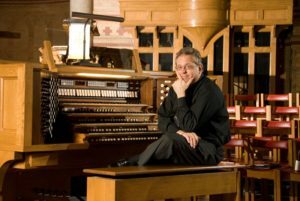 Mark Laubach received a Bachelor’s Degree in Church Music from Westminster Choir College in 1982 and a Master’s Degree in Organ Performance and Literature from the Eastman School of Music of the University of Rochester in 1984. He served for one year as Fellow in Church Music at Washington National Cathedral. His organ teachers have included Clinton Miller, George Markey, Donald McDonald, and David Craighead. Since winning first prize in the 1984 American Guild of Organists (AGO) National Young Artists’ Competition in Organ Performance, Mark has performed in many of the most prominent churches and concert halls in the USA and in Great Britain and Germany. Notable UK recitals have included appearances at Westminster Abbey and St. Paul’s Cathedral in London, King’s College Chapel in Cambridge, and cathedrals in Bristol, Chichester, Gloucester, Lincoln, Norwich, Wells, and Winchester. He is a frequent recitalist, clinician, presenter of hymn festivals, and competition adjudicator for National and Regional Conventions of the American Guild of Organists (AGO) and National and Regional Conferences of the Association of Anglican Musicians (AAM). He has recorded three critically acclaimed compact discs on the Pro Organo label: Teutonic Titanics, French Fest, and Mosaics in Sound. Canon Laubach teaches organ students privately and at Marywood University in Scranton. He is represented by the Concert Artists Cooperative, based in Sebastopol, California. In 2015 Canon Laubach had a very busy summer, which began with his serving for a fourth time as a Lay Deputy from the Diocese of Bethlehem to the General Convention of The Episcopal Church in Salt Lake City, Utah. For that gathering he was appointed by the President of the House of Deputies to serve on the convention’s Prayer Book, Liturgy, and Church Music legislative committee. In late July he hosted and was an organist for the King’s College Summer Choir Training Course of the Royal School of Church Music in America, which has been held annually at St. Stephen’s Church since 1995. In early August he traveled with members of the Choir of St. Stephen’s Church and the choirs and directors from Church of the Holy Spirit in Harleysville, Pennsylvania and Immanuel Church on the Green in New Castle, Delaware to England, where the combined forces served as the choir-in-residence for one week at Winchester Cathedral. As organist, Canon Laubach played for eight choral liturgies including five services of choral evensong, two choral masses, and a service of choral matins. Recent performances by Canon Laubach in 2016 have included recitals at the Cathedral of St. John the Divine in New York City, the Episcopal Church of the Good Shepherd in Milford, Pennsylvania, St. Stephen’s Pro-Cathedral in Wilkes-Barre, Trinity Episcopal Church in Moorestown, New Jersey, and Independent Presbyterian Church in Birmingham, Alabama. In April he was the featured soloist in two concerts of music for organ and orchestra (works by Saint-Saëns, Haydn, and Jongen) with the Northeastern Pennsylvania Philharmonic conducted by Maestro Lawrence Loh. 2017 performances will include a recital at St. Michael’s Episcopal Church in Marblehead, Massachusetts and a featured recital in June for the Region III AGO Convention in Richmond, Virginia.